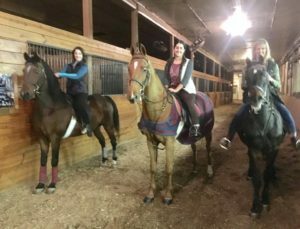 Our first offering of EqWine Ladies Night was a huge success with 26 Ladies attending the evening that offered fine wines and cheeses, camaraderie and lots of saddle time with our wonderful Morgan and Saddlebred School Horses. We had a few riders who had either never been on a horse, or had only ridden a few times, all the way up to riders actively in our lesson program also taking part in the fun event. First timers included Neeley Simmons (Center Valley, PA) and her sister, Megan Heitfeld, who came to us all the way from Texas! 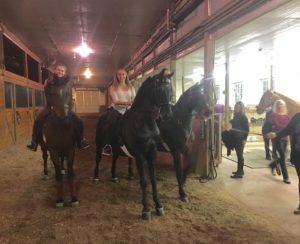 Scottfield customer Mandi Scheetz brought along her sister-in-law, Heather Reppert, and her friend Sam Mensch for their first rides. Heather took her first ride on Lily (Radiant Revival) while Sam stepped up on Partridge Hill Protest (Sparky), for her first leg-up in roughly 20 years. After taking their mini-lesson with Alicia, Adrienne Huynh (née Hariry) and April Wozniak both signed right up for weekly lessons. Adrienne enjoyed a strong Junior Exhibitor career showing in everything from equitation to pleasure to the three gaited divisions, and after several years out of the business, has decided to jump back into the ring at Scottfield. April also grew up showing Morgans and Saddlebreds and has already been to the farm for her follow up lesson. April and “Lily” hit it right off, and we are excited to add April to our ever growing strong group of adult amateur riders. Neeley Simmons also introduced friends Cass Bosco and her daughter, Devon, to Scottfield. Cass billed herself as a beginner, and I quickly determined that to be an untrue statement. She was great atop our beloved Hermitage Avatar (Ronni <3 ). And while Cass did a super job, her daughter Devon was a standout, riding the pants off of Sparky and leaving me begging for her to please come back so I could put her on one of my own personal show horses! Melina Brunson came to play and brought along with her Arabian aficionado pal, Cathleen Kaiser, to take a spin on a Saddlebred. Candi Aversenti brought along her good friend, Jeanne Shigo. 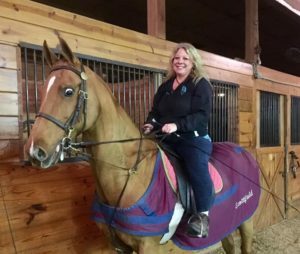 Jeanne spends most of her saddle time eventing, so this was a big change of pace for her, though she did admit to admiring Candi’s beloved Red Dawg (CH Cumberland Crescent). The evening ended with the night owls making their way to my house, where an epic dance off between Ashton Vattelana and Melina Brunson ensued. When it was over, Melina retained the Corked Crown, but we all agreed that Ashton entered the ring before she fully understood the strength of her competitor. 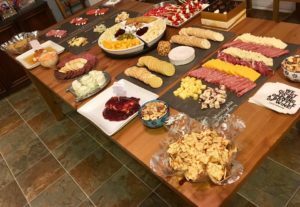 When the night drew to a close, the cheese (what precious little was left of it), and the wine (let’s be real– there was no wine left), was put away, the lesson book was filled, and 26 girls went to bed having enjoyed the company of dozens of other fellow horse-crazy ladies. From Virtual Personal Assistant Janice Frary, (who is responsible for the amazing MailChimp emails you all receive! ), to Scottfield’s one-woman Pep-Squad, Jenna Billger, we had a great time! It wasn’t even over yet, and the next EqWine night was being requested! A sure sign of a good time being had by all! 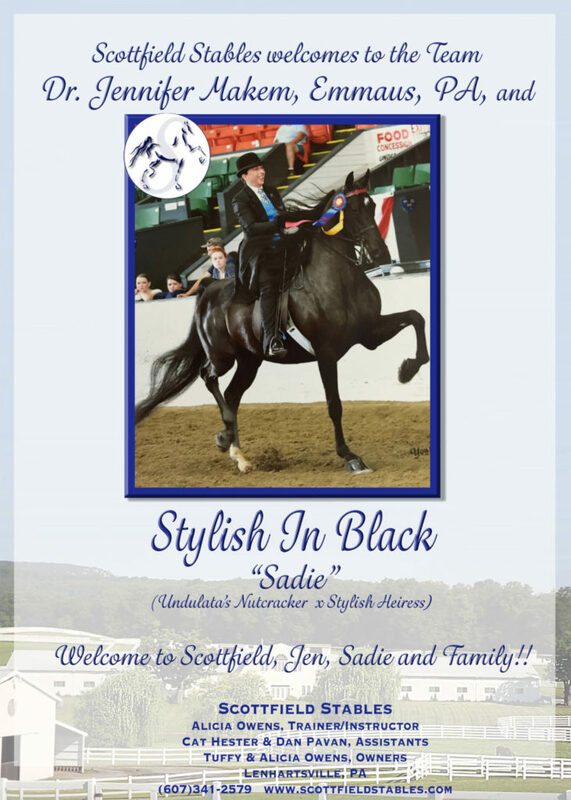 Scottfield Stables welcomes to the show string Dr. Jennifer Makem and her wonderful pleasure mare, Stylish In Black! Jen and Sadie have enjoyed several successful show seasons together and we are excited to see how their future unfolds here at Scottfield. 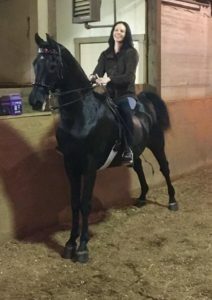 Jen is a long time rider with experience in the pleasure, performance and gaited divisions, and she comes to Scottfield as a very strong amateur rider who goes right to the top of our good riding roster. 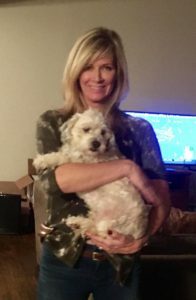 Welcome to Scottfield, Jan, Sadie and Family! EKL + SFS = A Winning Combination! Scottfield Stables welcomes new families and new horses to the herd! Scottfield Teams off to a great start in 2018! New Horses, New Riders, and New Customers find their way to Scottfield!